Hi, all. Can you believe it’s almost time for a holiday again? By now, I’m actually glad for another little spruce up opportunity, though. Christmas is gone and with all of Winter’s white, windy weather, things need some sparkle again. 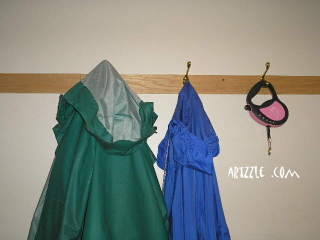 But, because it isn’t so friendly outside, now is a good time for one of my EZ-PZ projects. This one is super easy, using things you’ll already have around the house. AND you don’t need any fancy tools! PAINT SAMPLE CARDS and TISSUE BOXES are two of my favorite recycled/reuse craft items. 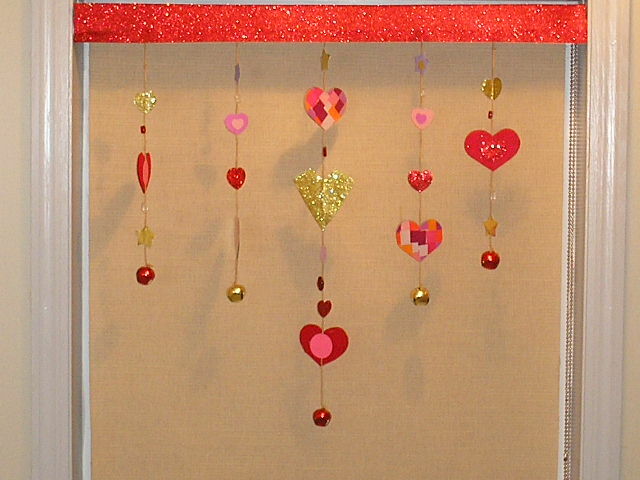 They have beautiful colors and designs and are a great weight for cut-outs. 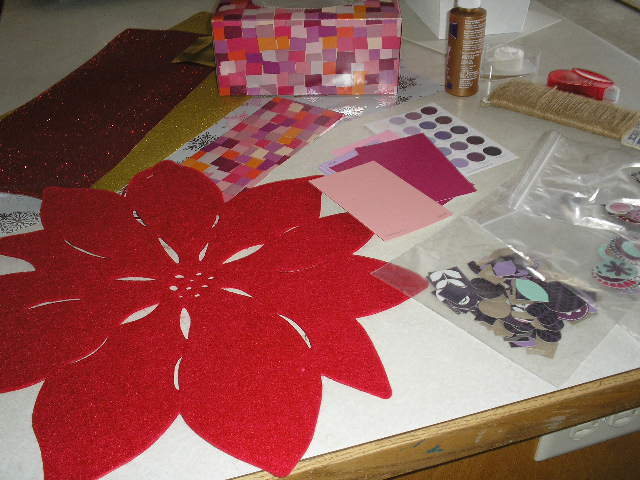 This project I also used WRAPPING PAPER CUTOUTS & A RED FELT PLACEMAT from among my post-season stash. The mat had a whopping $0.24 price tag. 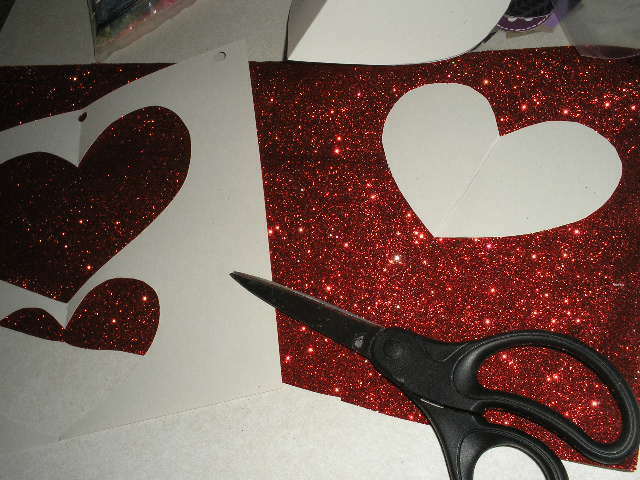 Though I did use a few punches here, I also did many things the old fashioned way … folding and cutting out larger heart shapes to use. The wonderful set of punches featured in some of these projects – are not mine. They were on loan from my daughter. I mention this so people won’t be discouraged. Most of my work is done with ordinary, everyday items like scissors, exacto knife and salvaged papers. Same goes for glue. You don’t have to have a hot glue gun or a glue wheel for everything. Less expensive double-sided tapes, tacky glue or elmer’s are available everywhere, and get the job done just fine. Cut five pieces of string. I used twine here. A number of things work; yarn, curling ribbon or fish line. You it light weight enough to have a bit of movement as it hangs down. I cut my longest piece at 25”. Two more pieces were cut at 20” and finally, two pieces at 17”. 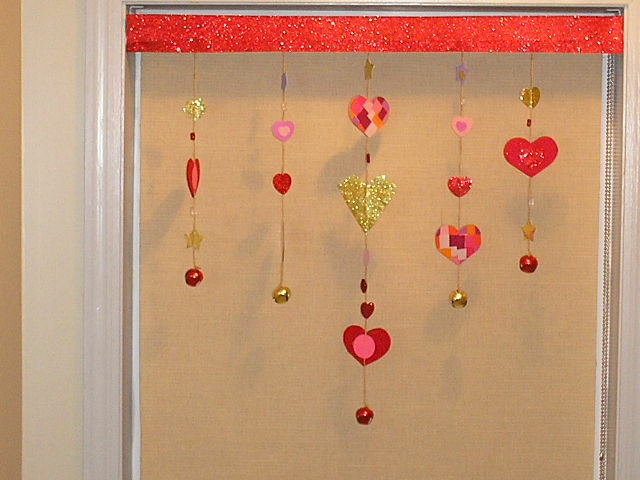 TIP: You’ll want to measure your window and see how long you want your pieces. REMEMBER that longer is better, so you have enough to tie to your rod, and more is always good because too much is better than not enough. 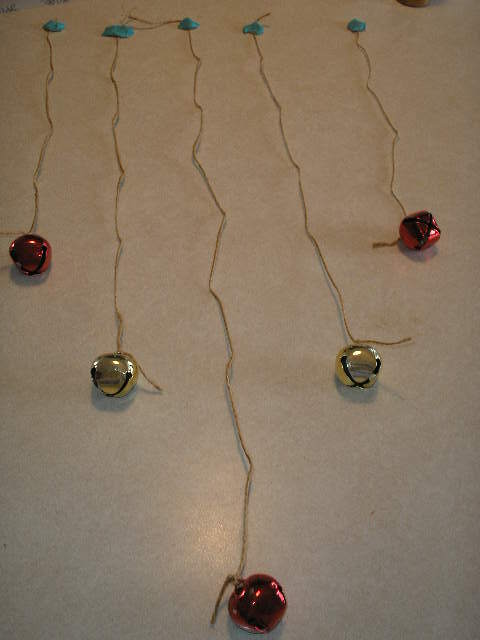 Here I laid out my string. Tops are held down with fun-tac putty and I’ve added my jingle bells at the bottom to help straighten out the twine. 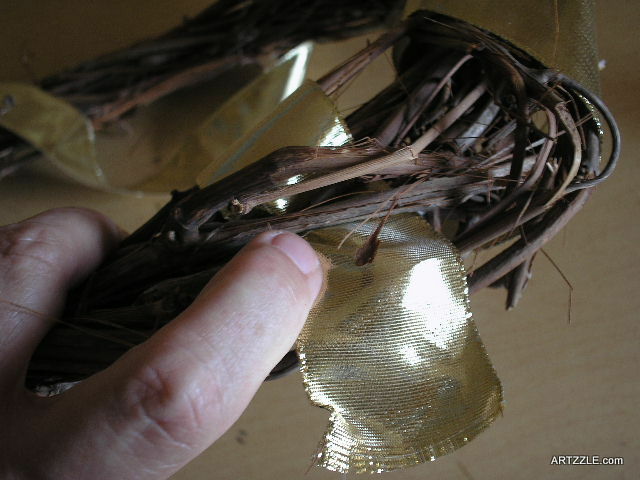 Trying a few dry design placements with my cutouts, when satisfied, I began to glue items to the twine. NOTE: The paper shapes are all doubled. You NEED TWO IDENTICAL PIECES for each display on your string. When applying, you will lay one cutout FACE DOWN, then place your string over it, and glue the matching cutout over the top. As well as helping the pieces adhere to the string, this gives you a pretty view from either side. Valentine’s Day is winter of course, so your window will be closed. But you’ll still get movement and in my example, I’ll have lots of movement since this window is above a heat register. In summer, you’ll get breeze from the open window. Now all I have to do is tie my strings to the curtain rod. In my Christmas Window Project SEEN HERE I used coordinating wrapping paper to make a sleeve for the rod. For today’s project, I simply tacked some matching ribbon to the front of the rod so I could hang it higher in the window. See you soon for more fun. As always, try not to stress about it, just start your project. 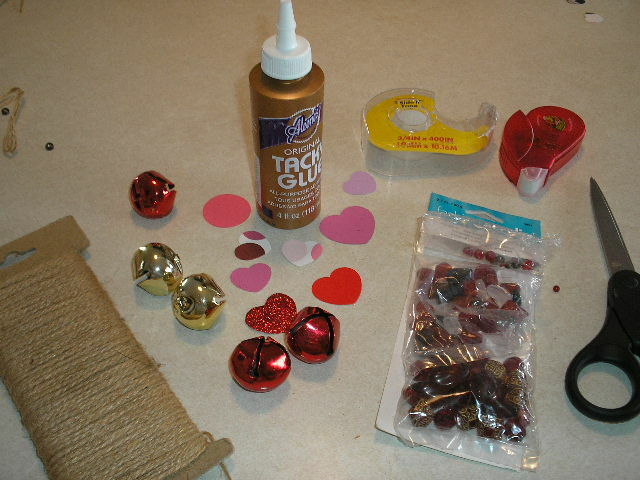 This original article “VALENTINE Projects” appeared first on Artzzle.com. No included content or photography can be used elsewhere without specific permission from said originators. Can You EVER have enough Storage Space? One of the things WE love about our home is our main living area with it’s vaulted ceilings and odd shaped walls. 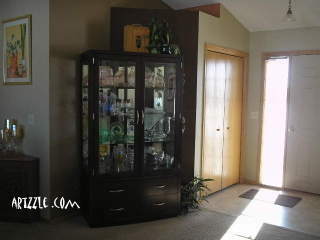 Something we didn’t like about this house was the limited storage as we have no basement. One of the things I love in our home, is my talented husband! I can just tell him about an idea I have and draw a little sketch. He does a little measuring, draws a real plan . . . and makes it for me. Now, everyone knows how I love to collect pottery, glass and BIG décor items and all kinds of other stuff; lots of pieces that are difficult to store, especially in a small home like ours. 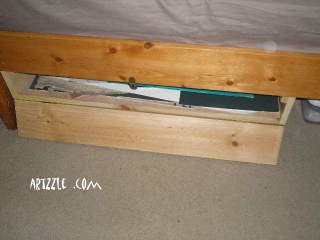 I got really tired of shoving everything in bins under the beds. In the first place, we only have two beds (and one is a twin), and secondly, there are things under there already. 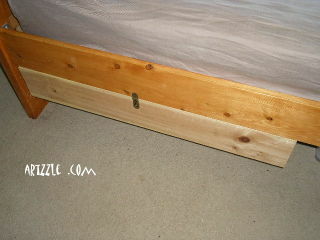 I did design & Hubs built, a special size storage area attached to the bottom of the twin bed frame. It’s just a simple attached drawer with a little hook to close it. Unlatch the hook, the door drops down and items are slid in. This holds my large paper, matting and artwork. The bed cover hides it, so we just left it raw. 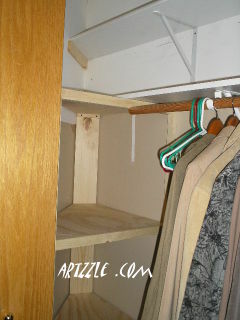 Another easy little idea provided extra coat storage. 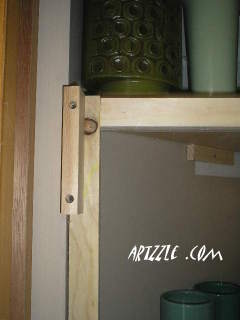 In the laundry room, a simple strip of molding was attached to the wall and hooks were added. The laundry room is a pass through to the garage and back door entrance, so is a perfect spot for hanging casual jackets, sweaters and the occasional dog leash. TIP: Be sure to anchor the molding strip to a stud or two on your wall. 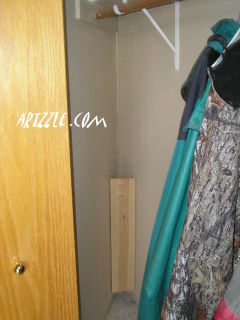 That will accommodate the weight of your hanging items, so the molding doesn’t pull away from the wall over time. 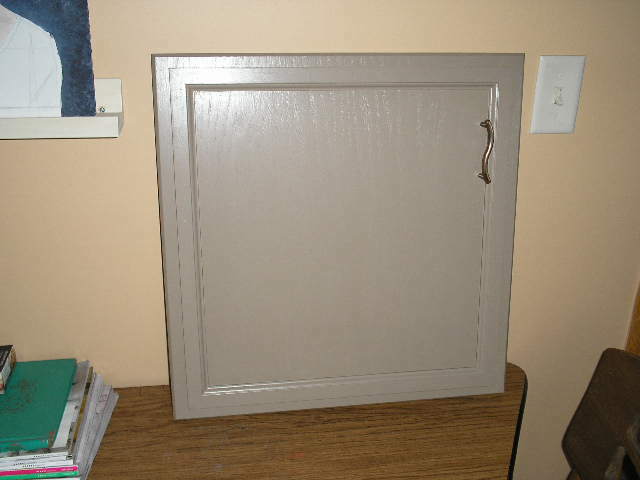 Our Projects List includes eventual cabinets for the laundry room as well. For a temporary fix I added shelves, featured HERE. We’ve made sure most of our occasional tables and furniture pieces have drawers and shelves, so that helps oodles. 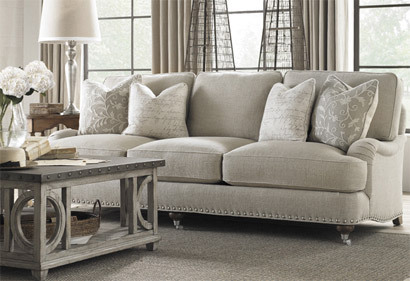 TIP: DOUBLE DUTY furniture pieces provide extra storage for any size space. A dresser could be used as a TV stand, with the drawers storage for equipment. End tables with shelves and/or drawers can be used in many rooms. Coffee tables with a shelf or open legs can house baskets for extra storage. This is our entry way. At the top of the shot you can see some of our angled, fun colored walls. I say “way” because it is simply a space between the front door and a closet; both which are an actual part of the living room. There’s no separate foyer. We’re accustomed to this feature. Our previous rambler was also designed with a little closet directly by the front room door. That is the only commonality in the two homes. Today’s market standards categorize this home as small at 1550 sq. ft., but our other rambler was only a 960 sq. ft. plan. 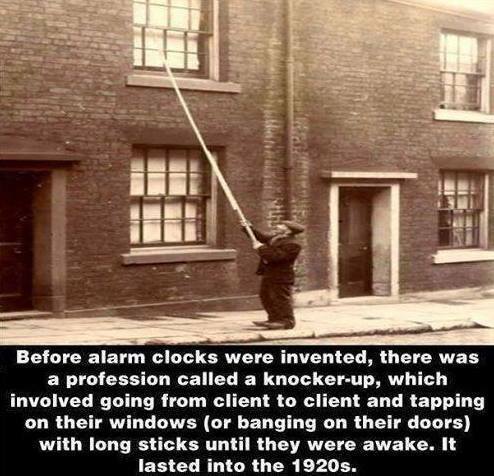 Now THAT was small, but that house had a basement. Don’t worry though, it was fine. And YES, we did a lot of changing, rearranging and customizing in that. Had to with 5 kids between us. 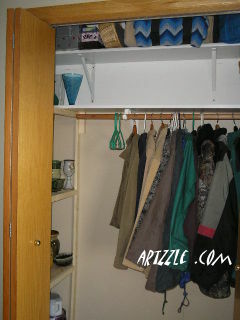 We really enjoy this entry closet because of it’s angles and the fun walls around it, on the outside. But, recently I was cleaning the closet, and getting frustrated with that jagged corner space inside, where all the less-important, rarely used junk stuff gets shoved. When the hanging rod is full, you can’t even get back in there. 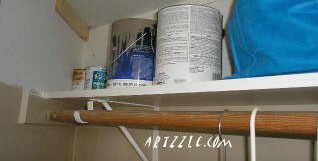 Plus, we store leftover paints in there, so they don’t freeze in the winter. I hate seeing those every time I opened the door. Soooooo, I went to find Hubs. I talked, he measured, he drew and then . . . began building. From this . . .
To this. 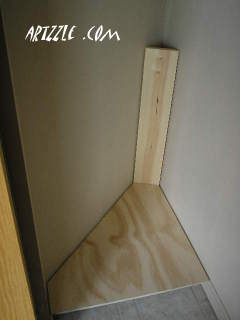 Here a second upper full length shelf was also added. Nice, right? Was I satisfied? Well, no. You could now see even more “stuff” when the doors were open. Solution: We had a fabric shower curtain in the donation bin. So I had him adapt for a rod. And voila’, see no more evil! Was that enough . . . uhhm . . . almost. 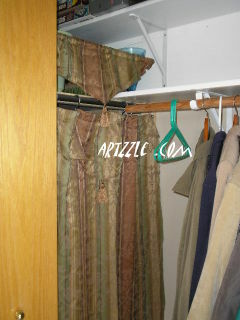 For that higher area, I took a simple tension rod and put up the valance to the old shower curtain. Now . . . done! So Cheryl now has even more storage AND it’s pretty, well sort of. At least stuff is stored and hidden! TIP: Don’t overlook small corners and odd spaces in your home that could be utilized for storage. IMAGINE and EXPERIMENT with spaces, pieces and places. Have fun! Lots more going on around here, even other storage projects, so, we’ll talk again soon! Apart from the obvious, my parents were two completely unique people, one from the other. On Mother’s Day I had no shortage of loving memories of my mom, to share. At only sixty two, she was gone in an instant, in a freak accident. I’ve missed her always but the loss seems even more acute as I grow older. Feelings are quite different for me regarding my father. There was fear, uncertainty and there continues to be resentment and anger, although all have lessened as I’ve aged. I wasn’t intending to write a specific Father’s Day post. Instead I did a Project Issue. In the present, it’s very important for me to stay positive and productive . . . in everything. I felt that posting about my father might stir up too many negatives. You know how fond I am of using angles. Well, today I decided to consider my dad from a different angle. Instead of simmering angrily, I tried to think of good things and began a list. When I was very small, my dad would sometimes draw little cartoon-like characters for me, or make me those cut-out paper doll chains. He would make the dolls and then I would draw and color them. It was one of my first good memories of him. Dad was musical. He had a good singing voice in church and played several instruments by ear. For a few years he put together a country style band and they would play for barn dances and events. At the dances, he put me in charge of “getting the floors ready”. Floors in the old buildings were often in poor shape and the wood was very dried out. So, you took a box of laundry soap flakes (not many liquids then) and sprinkled them over the floor, to make the dancing surface sort of slick; easier to dance on. This was done once or twice during the evening. Dad made that “my job”, and I thought I was really a big shot, given such an important responsibility. In my senior year of high school, my mom had a lengthy hospitalization for a serious illness and surgery. One evening in particular, my dad came home earlier than I had. When I got there, the dining room table was nicely set (we always ate at the kitchen counter) and dad had cooked dinner for us. Not just mac and cheese, but a steak and salad, mashed potatoes and gravy, with a little cheese and relish tray. There was no alcohol, just cold Cokes. He even held my chair for me. It was really something. That same spring, before she became so ill, mom had helped me pick out a prom dress. By the time alterations were done, she wasn’t able to go along, so my dad went. While I was trying the dress on, he and the clerk strolled through the little store, with him saying “Give me one of those” or “how about that”. I came from the dressing room to find a little group of lovelies. A pair of beautiful earrings, an elegant beaded clutch, long white gloves and the most precious white faux fur stole. That is my nicest and favorite good memory of my dad. There. My list does have a few pleasant memories. And admittedly, it’s much more productive and positive, to remember those instead of their opposites. I guess it was good for me to do an official “Father’s Day” post. If your dad is still with you today, give him a hug or a call. If not, blow him a kiss with a smile. I’ll sign off with a new line this time. Stay positive and you’ll stay productive. EZ PZ décor projects this Wednesday. You can accomplish these with everyday items and just 15 minutes of your time – or less! Autumn is the theme today, as we decorate a grapevine wreath. for all you tricksters out there. This is a Make-Do project for me. 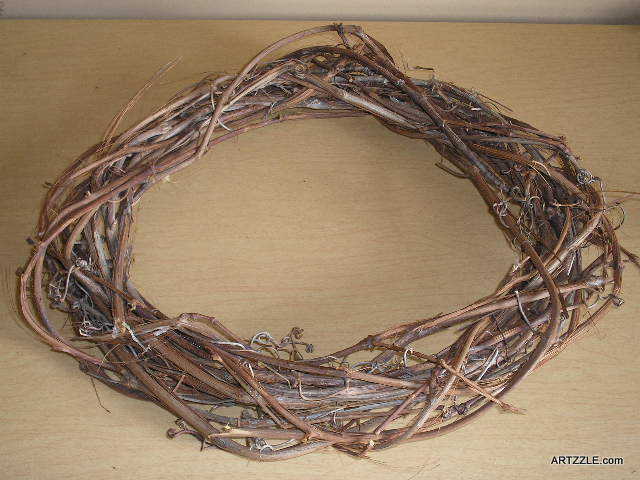 Last spring a friend gave me two grapevine wreaths from a yard sale. One was huge, the other smaller but a bit misshapen. 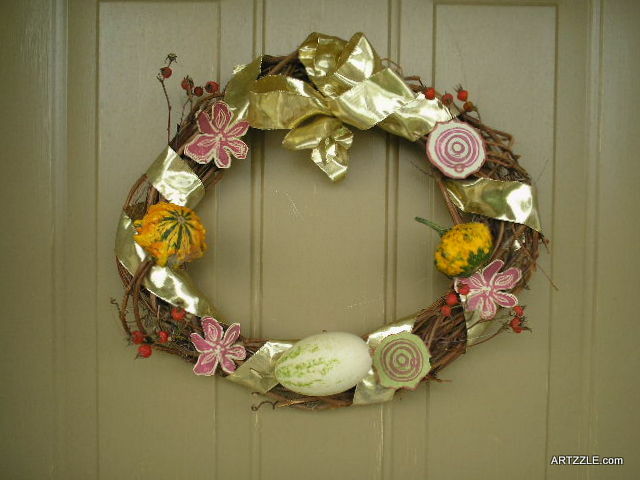 “whonky” if you will, so I’m using the small wreath today. 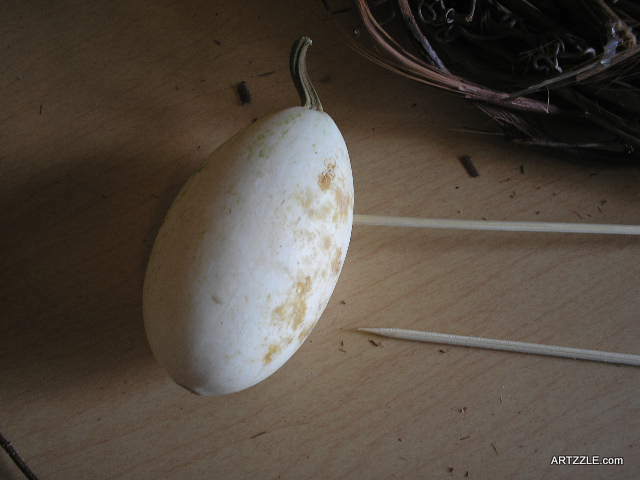 Last week I cut hips (orange berries) from my fading rose bushes, and I also found some cute mini gourds at a garage sale … 25 cents each or 5 for a dollar. My ribbon stock is slim on Fall colors, but I thought this bright metallic gold would work. And finally, two sheets of fun patterned paper from my stash. with the end tab on the back side. and gluing the two end tabs together, again on the back of the wreath. deciding where I wanted to place them on the wreath. one for the smaller pieces, and two skewers for the larger, heavier piece. You don’t have to be a florist or packaging genius to make a decent bow. 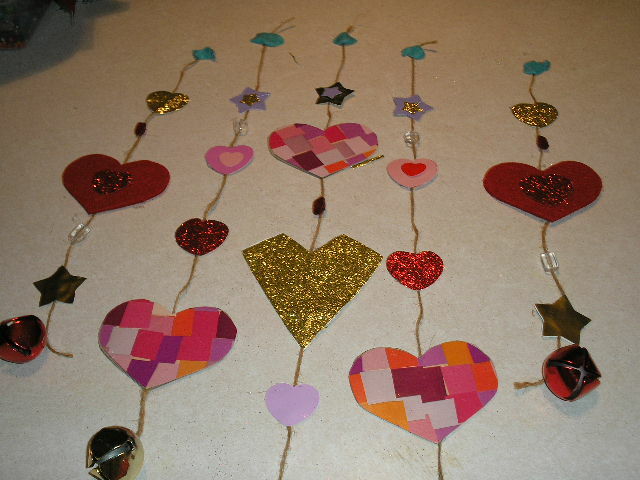 Here I chose this approach, because I didn’t have a lot of ribbon left to use. If you want a different look, just google BOW MAKING INSTRUCTIONS for oodles of other ideas. Just follow the pictures. I used twist ties to tighten the ends. These never hold on garbage bags but they work great for things like this! Once secured, just play with the ribbon to fluff up the bow. This is wired ribbon, but the process will work with most other types as well. After attaching the bow, I wanted to add a bit more color and interest. 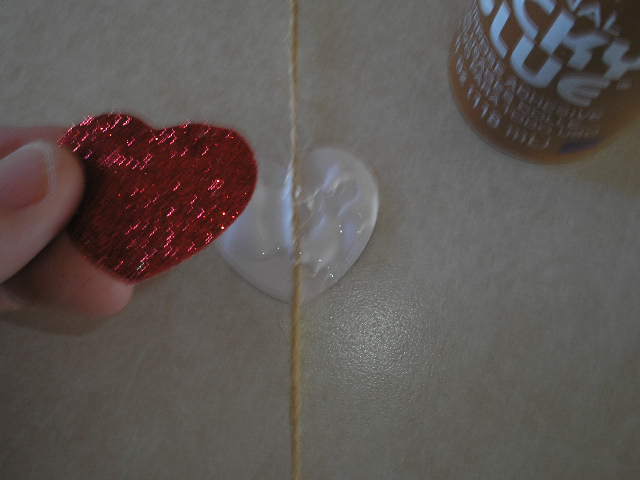 and attached with a dab of glue. Voila, the finished project, hanging on the front door. The photo isn’t true to the paper cutouts colors. They’re more orange and greens. They look dark pink and tans here. NOW REMEMBER … this is a HOW-TO post and I’m making do with what I have already at home. You may not care for these colors or materials but now you have the process down, and you’ll be using what you have available, making it personal to your style. At the gourd garage sale, I also found tons of other fun. Like this metallic gold star. I am crazy about star shapes, and not just at Christmas. Just adding it with these glass pieces on my piano, turned out lovely, especially in the morning sunshine! You may remember the wreath I made last Fall..
Below is the 2014 version. You can get complete instructions here. A couple very easy projects here, and the rag wreath for those long, cool evenings that will soon be here! So don’t stress about it, round up your stuff and start one! And ya know how I love hearing from you so leave a comment. Be sure to check “follow this post” so you can receive and see my reply. Because as you can see . . . he was a Very Big Boy. losing much of his pep and fire. Little Sister Gracie didn’t care. She snuggled and went with him everywhere. Gracie is with us to carry on. and all the wonderful. caring people there. IT’S POSSIBLE THE “G” COLOR IS IN MIND LATELY BECAUSE . . . I’m such a magazine maven, and it’s everywhere one looks, in all my magazines and books. I’ve been putting together a piece from the July/August TRADITIONAL HOME, with some beautiful stuff for you. View their IN GRAYSCALE LOOKBOOK . IT HAD TO BE DESTINY . . . because things didn’t stop there. LOOMED LARGE . . . another LookBook, had so many ideas in grays AND coordinating accents. Of course the first picture (above) jumped right out. ONE OF MY LONDON FOLLOWERS . 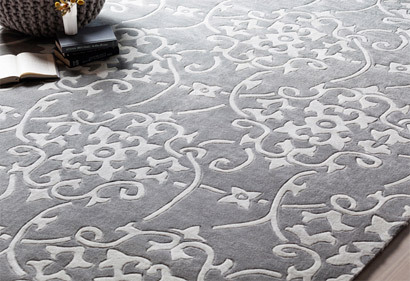 . . Jess Weber, recently purchased a new “flat” and asked me about gray (grey) carpets. Hey Jess, look at all these great examples! Catch her hilarious blog at JESS WEBER. AS FAR AS NEUTRALS GO . . . most people consider either beige or grays as the main choices, other than white, of course. Many relate beige with warm and gray with cold. I’m here to prove that . . . “It Ain’t Necessarily So”. And as for whites, go to any paint store or website and look at their “Whites”. You’ll find a wide range of choices, BOTH warm and cold! EVERY COLOR IN THE SPECTRUM . . . has warm AND cool tones, even those you consider as neutrals. Also, the “feel” of the color can depend greatly on the accent and accessory colors you use with it, and those in adjoining spaces. DONNA FRASCA IS A COLOR EXPERT . . . literally. Check out what she has to say about neutrals. Here’s Another interesting perspective on her blog. YES, IT’S STILL CRAZY BUSY . . . around our place. I have at least four other ideas I’m developing for articles. After the great results with our bathroom cabinets redo, Hubs and I have begun those in our kitchen. YOU MAY FIND IT DIFFICULT . . . to believe but, we didn’t choose the same gray finish for our kitchen. Big shock there, huh? And we want our island to be a different color than the rest of the cabinets out there. There was an entire quart left over of the gray from the bathroom. Now, I had (what I thought to be) a clever, and cost effective idea. I took it to my favorite paint mixer, Sue, at our local Marv’s TRUE VALUE. SUE REALLY KNOWS HER STUFF AND WE’VE WORKED TOGETHER BEFORE. (That’s probably why she groans when I walk in!) I explained my idea was to tint the gray to a bit different shade. After agreeing to sign in blood, saying I wouldn’t have repercussions if things didn’t turn out as I had hoped . . . we worked (for at least an hour in between other customers) until I hit on something I liked. Below is the color our island will be. Only the drawers and doors are finished at this point. I’M NOT SURE WHAT YOU WOULD CALL THIS COLOR . . . gray, brown, greige? With the light and wall color in the room where this picture was taken, it looks almost lavender, but really isn’t. Whatever, we love it – yes, Hubs does too! So a money saving, good idea right? Well, YES and NO. 1. Yes, it is possible to retint leftover paints. Just be sure you’re working with someone who knows what they’re doing … like SUE. 3. Always keep in mind that all colors NO MATTER WARM or COOL, are affected by their light and surroundings. You need to be aware of that when choosing your paints. NOW, I’LL CLOSE WITH ONE MORE FANTASTIC GRAY . 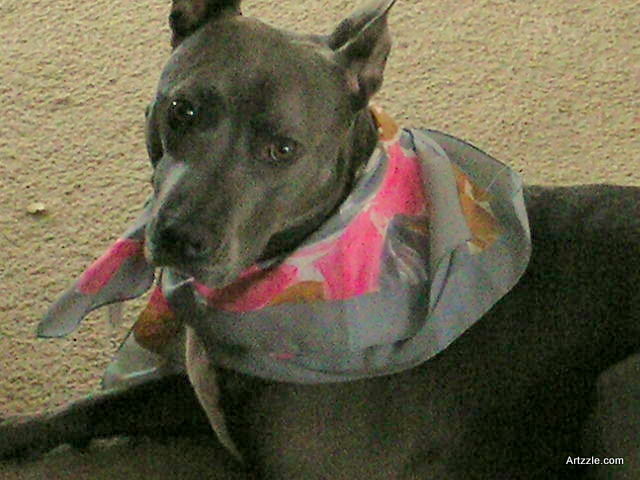 . .
the lovely, Gracie Mae. And aren’t those pink, beige and gold accents so becoming! IT’S THE STANDARD LAST LINE . . . don’t stress, just start! Hope this was a fun one. Check out all the links . . . they’re good ones! *** This original article “A LOOKBOOK … in Grayscale!” appeared first on Artzzle.com. No included content or photography can be used elsewhere without specific permission and accreditation from contributors. Outside sources are marked when available. Hi All. Here’s another super easy project using things you’ll already have around the house. NOTE: YOU DON’T NEED A LOT OF FANCY TOOLS. This project I also used more wrapping paper cutouts and punches, and a big red felt placemat among my post-season stash. It had a whopping $0.24 price tag. Though I did use a few punches here, I also did many things the old fashioned way . 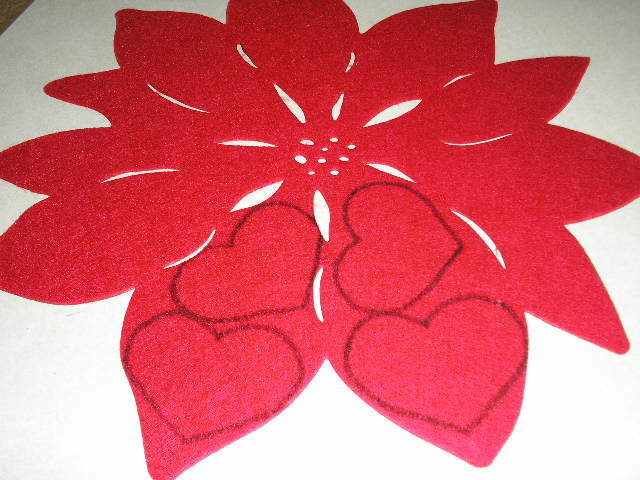 . . folding and cutting out larger heart shapes to use.